In his first comment on the class site, Harrison asked “Will learning through comics help our ability to write formal essays?” It’s a good question for all of you to consider. 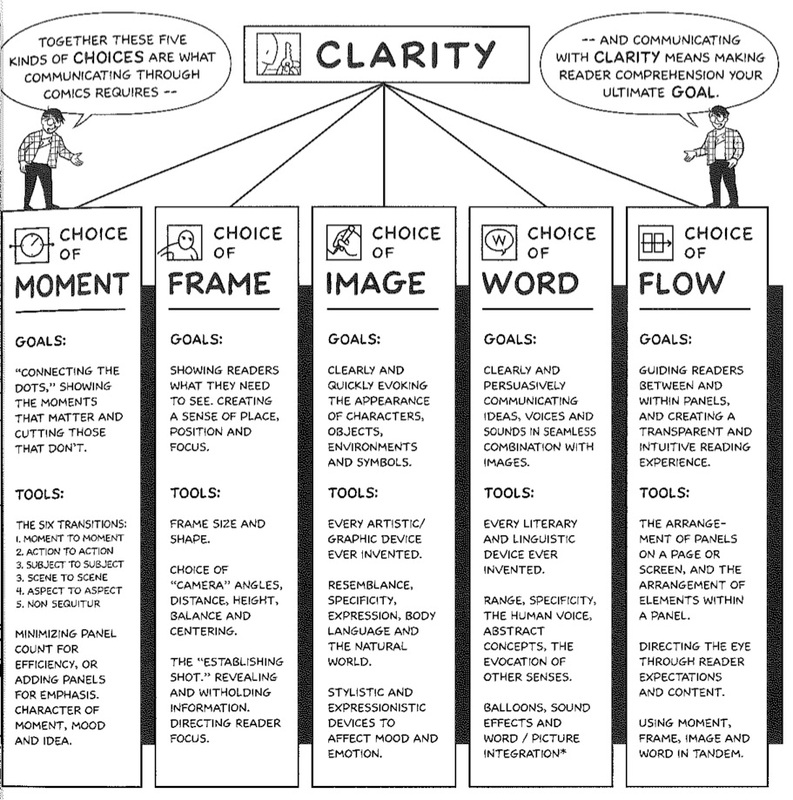 One way to begin to address the question is to consider Scott McCloud’s “Clarity” diagram from Making Comics. 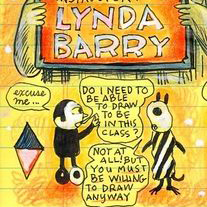 Lynda Barry. Detail from syllabus for ART448: Making Comics and other Graphic Formations. It’s a fairly simple table that serves as a sort of summary of the chapter: here, McCloud argues, are the 5 types of choices that authors need to make in order to communicate through comics. You will, when you make your own comics, consider each of these choices in order to convey your argument clearly and effectively. You might also use this table as a tool for reading rhetorically throughout the semester — as you move through the texts, you might hold this table up alongside them and ask yourself what sorts of choices these authors are making, and what those decisions tell you about the author’s goals and methods. Additionally, you might ask yourself whether paying attention to these 5 choices as an author yourself and as a reader is something only applicable to the medium of comics. When you write an alphabetic academic analytic essay for other classes, will paying careful attention to your own choice of moments to make your argument, how you frame those moments and the overall argument, the images you create in your writing, the specific words you use to convey your ideas, and the flow of ideas from one to the next be useful? When you read analytical essays for other classes, might it be useful to ask yourself about the choices of moment, frame, image, word, and flow those authors are making?